This article is about Tibetan Buddhist teachers. For other uses of the word, see Lama (disambiguation). Not to be confused with the llama, a South American mammal. 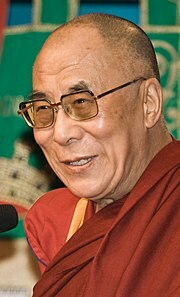 Lama (Tibetan: བླ་མ་, Wylie: bla-ma; "chief" or "high priest") is a title for a teacher of the Dharma in Tibetan Buddhism. The name is similar to the Sanskrit term guru and in use it is similar, but not identical to the western monastic rank of abbot. ^ "Online Etymology Dictionary". Etymonline.com. Retrieved 2013-07-17. ^ a b c d Marcotte, Amanda (2000-01-14). "Who Are the Tibetan Lamas?". Slate.com. Retrieved 2013-07-17. ^ Frank J. Korom (1997). Constructing Tibetan Culture: Contemporary Perspectives. World Heritage Press. ISBN 1-896064-12-4.